A very heavy turkey load for those Toms that would ordinarily cause you problems at 35-45 yards and even beyond. 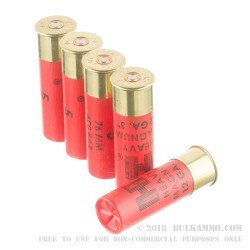 The nickel plated #5 shot that is delivered via a bulky 1 ½ ounce shot cup in a 3” Magnum loadout from the folks at Hornady moves out of the barrel at 1300 feet per second velocity and will be a shoulder bruiser over long periods of shooting with it. The 4 dram equivalency means you are shooting a massive round that is really putting lead on target. 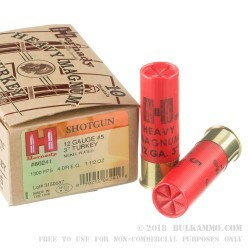 This is a small batch production round for the shotgun world and the resulting quality and attention to detail is apparent in every aspect of the round, not the least of which is the inherent benefit of the Hornady custom production line protocols which practically put a hand on the shells at every stage of their production. 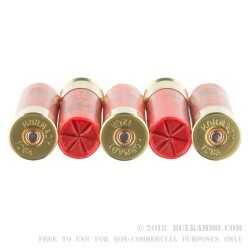 Yes it’s expensive ammunition, but the resulting performance and capabilities of the round make it worth every penny of the price point. 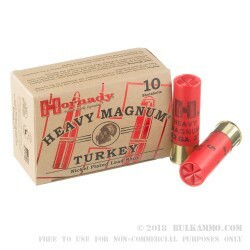 This is a Heavy Magnum round that can be reloaded and will function in big turkey guns with semi-auto functionality thanks to the robust build and the high base shell design. The massive payload will ensure that you get your turkey every time.